KEY Double Front Contractor Dungaree is constructed better than other brands and has the features used most in a Construction Dungaree. 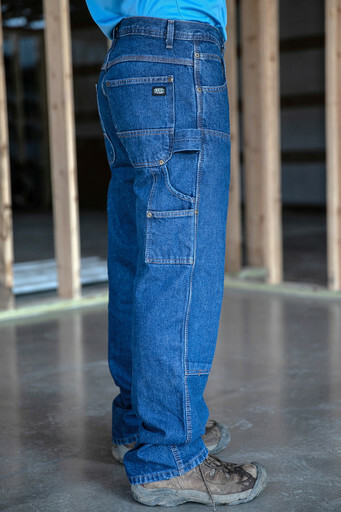 KEY has the expertise to make a Construction Dungaree feel great and Stands Up to whatever your work day throws at you. The heavyweight denim provides protection and is built to endure vigorous working conditions, while the chap style double front with cleanout gives you double the durability right where you need it. Rivets, reinforced pockets and triple needle stitching give this dungaree superior strength. Keep all your essential tools right at your fingertips with the tool look and the variety of pockets. This KEY Dungaree features a Medium Stone-Washed Finish, a soft feeling fabric, which is a lot tougher than it would seem, making your Tough Jeans feel great! It's a tough job, so wear KEY when you do it! This video is about the Heavy Duty KEY Contractor Grade Double Front Denim Dungaree 403.45. This Tough KEY Dungaree has 18 Brass Rivets at stress points!